The World isn't suffering from a dearth of solutions for carrying around all of your stuff. While Timbuk2 seems to have the market for messenger-style laptop bags and backpacks cornered (a trip to CES or any other trade show and you'll see many a conventioneer sporting a Timbuk2 bag replete with their corporate logo), the fact remains that San Francisco-based Chrome bags is in many ways the bag of choice of the City's rather colorful bike messengers. Of course, any bag that is preferred by that motley crew is bound to be both simple and tough. And such is the case with the Chrome Sentinel. A relatively small backpack, the Chrome Sentinel is expandable with a volume that starts at 16L and expands to 24L. Like most other Chrome bags the Sentinel is extremely simple and lacks many of the rather superfluous bells and whistles that other bags boast. 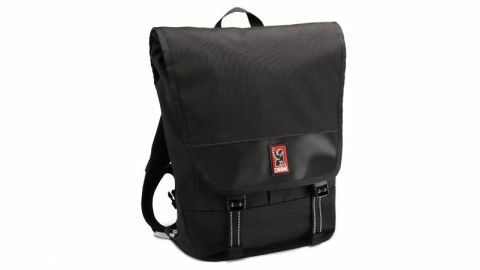 The bag sports a main compartment with a flat bottom that according to Chrome is perfect for "books, binders, or a 12-pack." It has one zippered pocket for those important things that you absolutely cannot lose like cell phones, keys, or a passport. It also rocks two slots that are perfect for business cards or other necessities. There's also a slightly bigger slot that was perfect for a book or a smallish, say, 7-inch tablet. As we mentioned before the Chrome Sentinel is an extremely simple backpack. Simply put there's absolutely no padding on the inside. So if you just throw your devices in the bag they'll likely get beat up a bit. The laptop pocket is designed to fit a machine up to the size of a 15-inch Macbook Pro but, much like Chrome, we recommend getting their padded sleeve which is an additional $40. We tested the Chrome Sentinel with a Dell XPS 12 Windows 8 laptop with Chrome's 13-inch padded sleeve. Sitting in the laptop pocket all by itself our test machine seemed extremely vulnerable, but once we placed it in the padded sleeve we were comfortable that this could take a beating. Since Chrome bags are basically designed for bike messengers it should come as no surprise that, in many ways, comfort is a higher priority than the stuff inside the bag. To this end the Sentinel boasts an EVA foam back panel that Chrome says adds "breathability" in addition to comfort. While it is plenty comfortable in our tests we failed to experience this "breathability." After filling it with our test laptop (in the padded sleeve of course), some tools, and extra clothes we hopped on our bike and rode around. The shoulder straps were extremely comfortable. That said, compared to other Chrome bags the Sentinel is relatively small. It's most definitely a day pack or a secondary pack for a business trip. The sternum strap did a great job of distributing the load. The Chrome Sentinel is very comfortable, whether walking or riding a bike. Like all Chrome bags it's super-sturdy, weatherproof; and it's guaranteed for life. The Chrome Sentinel is relatively expensive, it lacks internal padding and it's small. All in all if you're in the market for a simple, yet sturdy bag for day use, you'll be pretty stoked with the Chrome Sentinel. Just be warned that you'll probably also have to pony up the extra cash for the padded laptop sleeve.